Application Deadline extended to Friday, September 7, 2018. 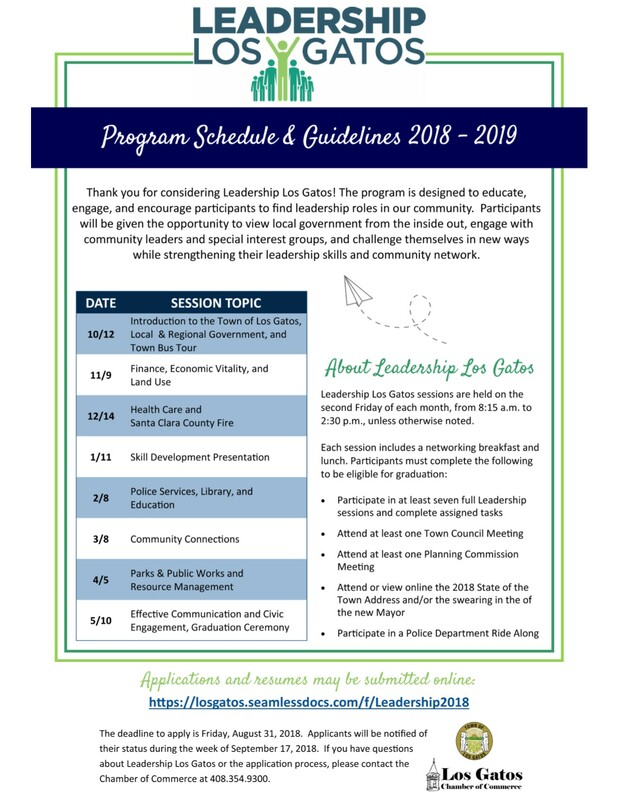 The Town of Los Gatos and Los Gatos Chamber of Commerce invite you to learn, engage and lead through Leadership Los Gatos. Each session offers participants the opportunity to become more familiar with the Town of Los Gatos and its role in Silicon Valley. Sessions include presentations on Town Departments and services, as well as a variety of community organizations that are vital to the health, safety, education, comfort and well-being of Los Gatos. Participants interact with community leaders, industry professionals, volunteer groups, and one another to build a stronger network while adopting strategies to become more effective through community engagement. Graduates of Leadership Los Gatos move forward as stronger leaders inspired to participate in our special community and eager to effect positive change. Tuition: $400.00 (payable upon acceptance, due by Friday, September 29, 2018). Includes all program activities and lunch at each session. Leadership Application - Applications are due on Friday, August 31, 2018. Applicants will be notified of their status during the week of September 17, 2018. For more program information Click Here or see below.